In a profile on running back Adrian Peterson, who now plays for the team in Washington with the racist name, Bleacher Report‘s Master Tesfatsion reveals that the running back who was infamously suspended following a public child abuse case, has moved from disciplining his children with a switch to disciplining them with a belt as they have gotten older. In 2014, Peterson lost a year of eligibility in the National Football League due to a court case in which the star running back was alleged to have whipped his then 4-year-old with a switch until lacerations appeared on the child’s body, prompting allegations that Peterson abused his child. Photos of the child’s injuries went viral, showing the bruises and cuts on the child’s legs, back, behind, and scrotum, which prompted a nationwide discussion on the proper ways to discipline a child. As an East Texan, Peterson claimed the discipline was part of southern culture, and told Bleacher Report that he continues to discipline his child. At the time, Peterson maintained that the child didn’t move or cry during the whipping to justify it. After Bleacher Report‘s profile on Peterson broke and it was revealed that he still used corporal punishment, Peterson’s agent, Ron Slavin, decried the story as an episode of bad journalism, accusing Bleacher Report and Tesfatsion of betraying Peterson’s trust, claiming that the story was supposed to stick to the territory of Peterson’s comeback. 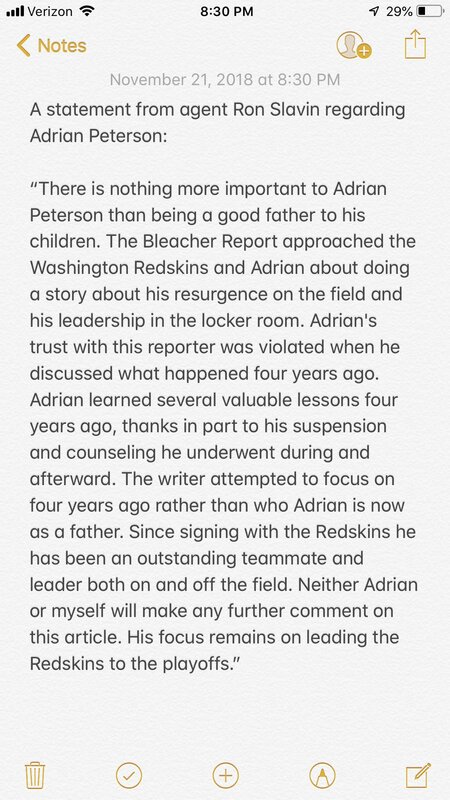 Slavin wrote in his statement, “Adrian’s trust with this reporter was violated when he discussed what happened four years ago.” In addition to Peterson’s agent, many Twitter users came to the running back’s defense and criticized the article written by Tesfatsion as a smear job. It seems as though the national conversation started unwittingly by Peterson is still an ongoing and evolving one. Just a few weeks ago, the American Academy of Pediatrics decried spanking as an unhealthy way to discipline children and recommended reinforcement of positive behaviors, setting limits, redirecting, and setting future expectations as far more effective alternatives. However, in response to their declaration, the American College of Pediatricians affirmed that spanking was a “valid option” for parents, which puts the two organizations at odds as much as it puts some millenials raising children at odds with their parents who were raised in a time when corporal punishment was much more socially acceptable. This conversation specifically reveals a divide in Black communities, and shows how difficult it can be to break entrenched beliefs and completely embrace new ways, even with the threat of national scrutiny lingering overhead.